Ken a handsome sum, as well as providing him free room and board. Coupled with his income from the Brunswick school, Littleton was now in a position to make a lot of fairly easy money. Would he, would anyone, jeopardize such an arrangement on the very first night? It must be clarified, however, that although October 30, 1975 was Littleton's first night on the job, it was not the first time he encountered the Skakel children. He had already been tutoring some of them for at least a week. He knew a few from the Brunswick school (Michael attended another school). Unfortunately, we have limited intelligence as to the full nature of Littleton's relations with Tommy and Michael. This is one area of uncertainty particularly laden with rumor and innuendo. One rumor/allegation has Littleton involved in quasi-homosexual behavior with the Skakel boys. This detail, among others equally as dubious, was filtered into Dominick Dunne's A Season in Purgatory--a greatly embellished, but interesting indication of high-Greenwich-society rumors surrounding the case. Other rumors suggest Littleton did drugs, specifically cocaine, with the Skakel children, and may have even been their supplier. It must be emphasized that we have not come across any substantive evidence to support these theories. Further investigation is required to flesh out the true nature of Littleton's relationship with Tommy and Michael, both before and after the murder. It certainly seems, today, as though Littleton got along better with Tommy. 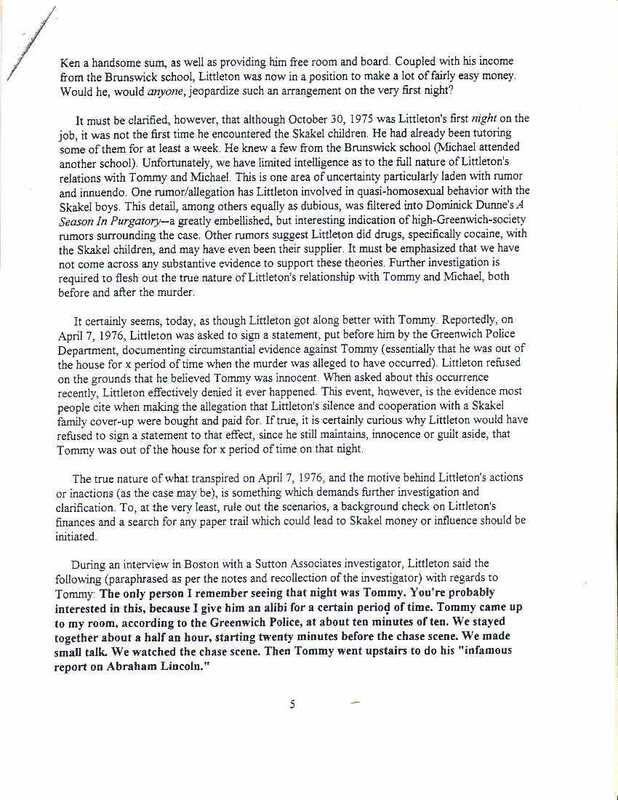 Reportedly, on April 7, 1976, Littleton was asked to sign a statement, put before him by the Greenwich Police Department, documenting circumstantial evidence against Tommy (essentially that he was out of the house for x period of time when the murder was alleged to have occurred). Littleton refused on the grounds that he believed Tommy was innocent. When asked about this occurrence recently, Littleton effectively denied it ever happened. This event, however, is the evidence most people cite when making the allegation that Littleton's silence and cooperation with a Skakel family cover-up were bought and paid for. If true, it is certainly curious why Littleton would have refused to sign a statement to that effect, since he still maintains, innocence or guilt aside, that Tommy was out of the house for x period of time on that night. The true nature of what transpired on April 7, 1976, and the motive behind Littleton's actions or inactions (as the case may be), is something which demands further investigation and clarification. To, at the very least, rule out the scenarios, a background check on Littleton's finances and a search for any paper trail which could lead to Skakel money or influence should be initiated. During an interview in Boston with a Sutton Associates investigator, Littleton said the following (paraphrased as per the notes and recollection of the investigator) with regards to Tommy: The only person I remember seeing that night was Tommy. You're probably interested in this, because I give him an alibi for a certain period of time. Tommy came up to my room, according to the Greenwich Police, at about ten minutes of ten. We stayed together about a half an hour, starting twenty minutes before the chase scene. We made small talk. We watched the chase scene. Then Tommy went upstairs to do his "infamous report on Abraham Lincoln."